Google+ is a new social network application that Google has recently introduced. It is like both Facebook and twitter, yet even more awesome. With killer features such as hangout, where several friends can join a VIDEO chatroom, and even watch youtube together! You never need to have physical hangout with Google+ hangout.. Very nerdy yet awesome feature! 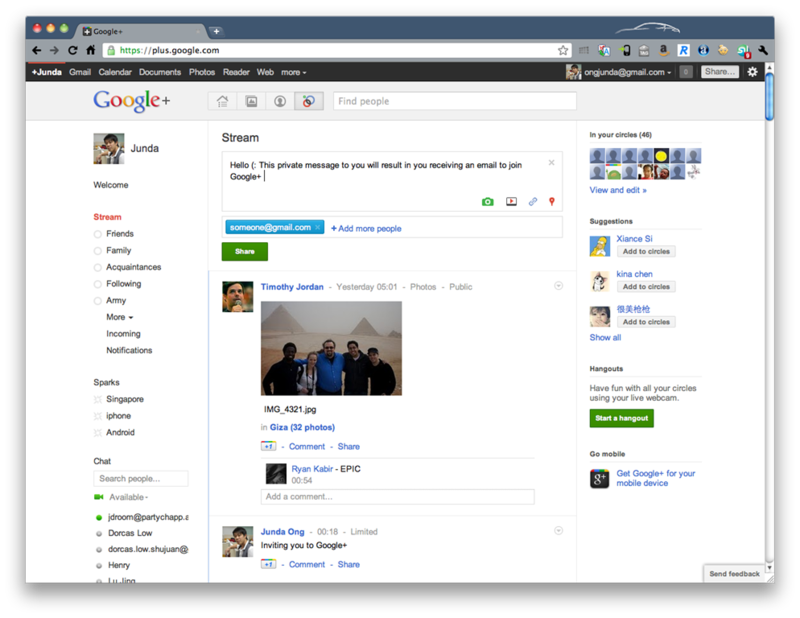 No doubt Google+ is one of the most awesome thing on the Internet now. But the problem is that it is released in its very early stage, so only those who are invited can try it out. And although Google+ users can invite ~300 friends, the invite mechanism was shut down due to insane demand..
Post something in his steam. Add the email of the friend to invite. A screenshot of how I invite someone@gmail.com to Google+ in my stream. Where to find an existing user to help? If you need an existing user to perform the above invitation workaround, I can help. Just leave a comment below with your email. Update: If you did not receive an email from Google+, do not panic. Wait for another day, or two. They should arrive.. Tips: To increase your chances of being successfully invited by Google, you should create a google profile with your gmail, and +1 something. For example, +1 this post! ← How to update to iOS 5 beta?